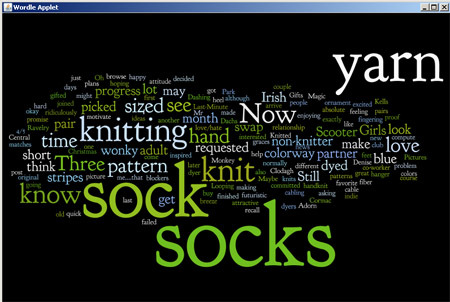 Someone on Ravelry introduced me to Wordle. You plug in any text or a link to your blog or website and a Wordle is created for you! The more a word appears in the text you supply, the bigger that word appears in your Wordle. You can play with colors, fonts and make it horizontal or vertical. If anyone makes a Wordle for their blog please leave me a comment with a link. I'd love to see it. All credit goes to www.wordle.net! Very cool. I've made wordles and could never get them to post to my blog. I only get a red x in a box. Very frustrating. How did you get yours to show up? What did I do wrong? Awesome! I'm a taxonomist, and that looks a whole lot like a tag cloud. My professional interest is actually the intersection between hierarchically arranged controlled vocabularies and free-form user tagging. This is... interesting. As is the combination I found in there: YARN NOW! That's how I feel about it too. I came, I saw, I wordled! This page contains a single entry from the blog posted on January 20, 2009 12:37 PM. The previous post in this blog was So far, so good. The next post in this blog is Sock Success.